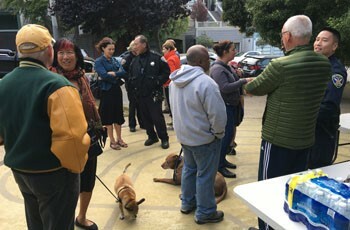 About 30 Duboce Triangle neighbors attended Meet the Beat, held outside at the Scott Street Labyrinth on June 29 from 6-7:30 p.m. Park Station Officers Sung, Whitfield, Ng, and Prillinger were on hand to discuss public safety in the Duboce Triangle, address continuing problems and issues, listen to resident complaints, and answer questions. 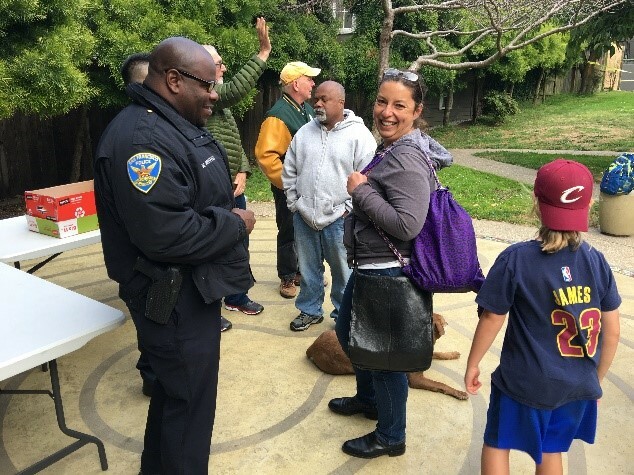 All four officers were very familiar with the Duboce Triangle and Duboce Park and Officer Whitefield was raised on the 400 block of Duboce and played in Duboce Park as a child. The format was very casual and neighbors were encouraged to talk about whatever was of interest to them. The flyer advertised that Park Station wanted to know our perspectives on crime, community policing, and the collaboration between the police and the Duboce Triangle. A few neighbors complained, include one person who was frustrated after having her car window broken twice recently and another person who complained about homeless encampments, including one at 15th and Noe. But many people also complimented Park Station on the job they have been doing in the Triangle and many said they feel safer since Capt. Sanford became commander at Park Station in April 2015 and when all of the Triangle became served by one police station instead of three in July 2015. The event was sponsored by Park Station and their Community Police Advisory Board, which is comprised of neighborhood leaders from the Park Station district. National Night Out, another community police event, takes place in Duboce Park on Tuesday August 1 from 5-7:30 p.m., and will have entertainment, arts and crafts, dance performance, hula hooping, law enforcement information tables, citizen complaint tables, a police motorcycle and ATV, a police horse and dog, and more.